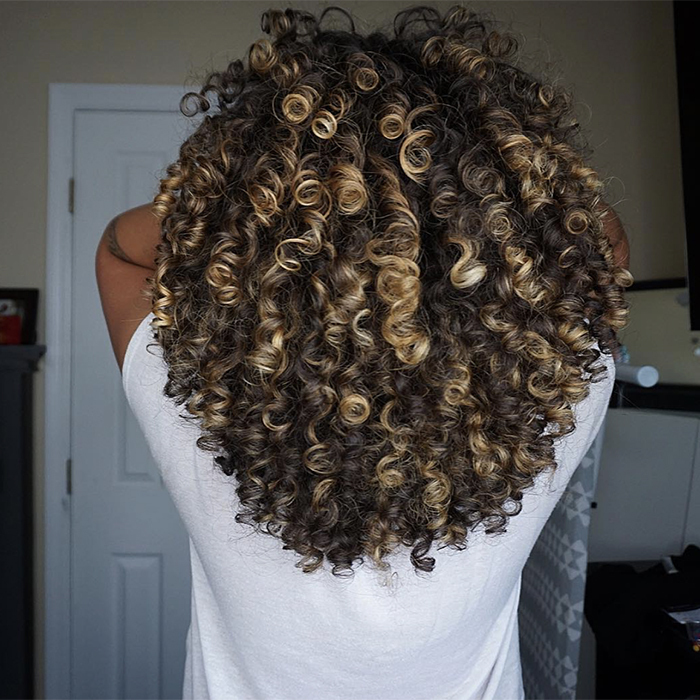 As the humidity rises in many areas of the country - including here in NaturallyCurly's home in Austin, TX - I usually reach for my trusty can of hairspray to set my curls and ward off the frizz that can set in as the day progresses. But like many curlies, sometimes I want an alternative to hairspray. Many curlies don't like the feel or the smell of hairsprays. Don't despair! When you are looking for non-hairspray options that give you the hold of hairspray, there are several good options. Here are some of my favorites. A texturizer spray won't give you the same hold as a high hold hairspray, but if you are looking for a lighter hold or just a way to set your style while adding some extra texture, this is the best answer without hairspray. This is a lightweight choice that will leave hair less weighed down than your typical hairspray while still giving you a little control. Some good ones to try are Volaire Air Magic Texturizing Spray, Dry Bar Triple Sec 3-in-1 and Garnier Fructis De-Constructed Texture Tease. Another one of the best alternatives to hairspray is dry shampoo. This works because it removes excess oils which may keep hair closer to the scalp at the roots. By eliminating the extra oil, roots are given an instant boost similar to applying hairspray. With this method, just be careful not to overdo it since it can lead to dryness if used every day. And make sure you find one that works with your hair color. Some brands can leave a light/white cast on dark hair. Some to try include Alex Anderson Curl System Morning After Dry Shampoo, Batiste Dark Dry Shampoo and DevaCurl No-Poo Quick Cleanser. Another way to get an impressive hold without the hassle or crunch of hairspray is probably already in your pantry. Sugar cane extract has curl enhancing capabilities, as well as hold. When used directly on the scalp, it can also unclog pores and act as a clarifying treatment to exfoliate and promote hair growth. Sugar is known to give some hold without making hair too hard. It is also a really easy DIY approach that only requires two ingredients. Just check out this recipe. Shea butter may be one of the most beloved ingredients for curly girls around the world. But one attribute that may not get as much attention is its ability to provide a decent amount of hold for your curls when used as a pomade to avoid the use of hairspray. Simply take some pure shea butter and rub in between your hands before applying to your hair. This will give some hold while also offering hydration for thirsty strands. There are some great shea butter options: TGIN Organic African Shea Butter, SheaMoisture Shea Butter Infused with Coconut & Hibiscus and Kreyol Essence 100% Natural Haitian Shea Butter. Hair pomade is one of those styling products that many people are confused about. Contrary to popular belief, it's available in different holds, finishes, and textures. Pomades of the past were usually beeswax or petroleum based for heavy styling. Although newer editions may contain traces of both wax and petroleum, other additives create a smoother, lighter finish. To set your curls, rub a little pomade rubbed between the palms, pull your hair back like your making a ponytail or bun and than twist it. When you let it go, your curls should be more defined, and the pomade will add hold to keep them looking good throughout the day. If your hair does start to look frizzy, just redo the process. Some good pomades to try include Darcy's Botanicals Organic Coconut and Cupuacu Natural Hair Butter Pomade, Ouidad Clear Control Pomade and Mielle Mongongo Oil Pomade-to-Oil Treatment. Do You Really Need to Use a Finishing Hairspray?